With plenty of cheap restaurants, souvenirs shops, and sunburnt British tourists, Albufeira is the quintessential beach resort town. 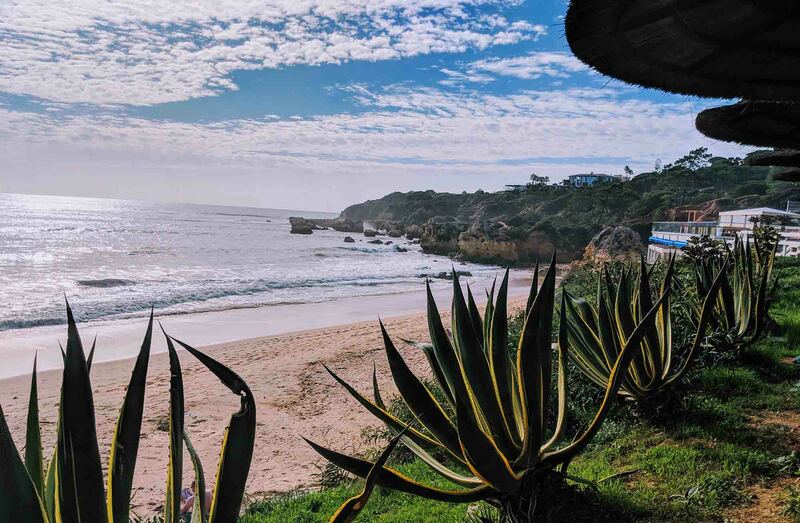 Although this is definitely Albufeira vibe, it tends to attract just about every kind of tourist including families, stag and hen parties, backpackers older travellers, and just about everyone else. Albufeira has a lot going for it, which is why it’s become the most popular town on the Algarve. It has plenty of beaches nearby, including several that you can walk to from the town centre, and its central location is ideal for those that want to take day trips to different parts of the Algarve. It also has plenty of accommodation: everything from cheap apartments to 5-star hotels. Albufeira isn’t for everyone. For some people it’s just too touristy, while that’s exactly what some others are looking for. Is Albufeira right for me? You’re looking for a resort town with easy access to the beach. You want buzz, and you don’t mind being surrounded by other tourists. Then, yes, Albufeira (Old Town) is right for you. You want to party. Perhaps you’ve just graduated university, or perhaps you’re on a hen or stag party. You want somewhere where you can do a bit of a pub crawl and maybe hit a few clubs afterwards. Then, yes, Albufeira (The Strip) is right for you. Not sure if Albufeira is the right choice? Here are a few alternatives. Praia da Rocha has a similar vibe to Albufeira, but isn’t quite as busy. Carvoeiro and Alvor are both coastal resort towns, but much smaller and much more low-key. Lagos is a laid-back coastal town that’s popular with surfers, backpackers, and young couples. Vilamoura is an upmarket resort town with higher-end restaurants and bars. Still not sure where’s right for you? Read the introduction to the Algarve which lists of all the different towns and cities. 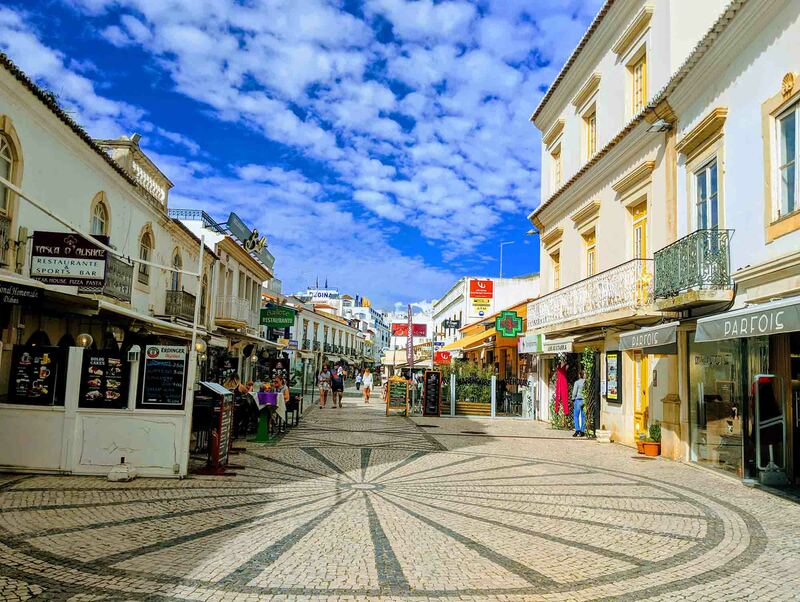 Albufeira’s Old Town is made up of beautiful cobbled streets, interspersed with souvenir shops, restaurants, and bars. During the summer months, there’s a good buzz as buskers and holidaymakers mingle in the squares and enjoy the good weather. Although The Strip is the place to go and party, that’s not to say that you can’t have a good time in Albufeira’s Old Town. You’ll find plenty of bars here, and plenty of people sampling their wares, but the atmosphere in the Old Town is more family-friendly than The Strip. In terms of beaches, Praia dos Pescadores is right in front of the Old Town and connects to Praia do Inatel and Praia dos Alemães. Together, the beaches stretch for almost 2 km which, even in the height of summer, is more than enough beach for everyone. Areias de São João (or The Strip, as it’s more commonly known” is a long road packed with bright neon-lit bars, restaurants, and nightclubs. The party starts early here: it’s not uncommon to see groups of people drinking at midday or even before, and it usually continues until the early hours of the morning. Along the road, there are plenty of kebab shops and other cheap eateries where you can grab a bite to eat and refuel before you continue partying until the early hours. 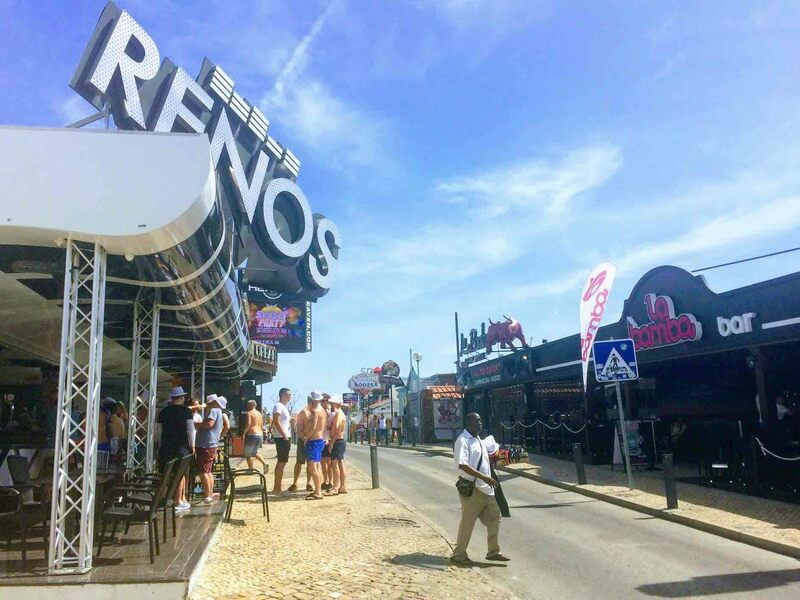 You’ll see plenty of stag and hen dos in Albufeira, as well as groups celebrating birthdays and other special occasions. If you’re visiting Albufeira to celebrate, this is the place to do it. The nearest beach, Praia da Oura, is roughly a 10-minute walk downhill from the bottom of The Strip. It’s a steep uphill walk to get back, which has earned this hill the nickname “cardiac hill,” but it’s a small price to pay for getting to enjoy Praia da Oura. Flights: The nearest airport to Albufeira is Faro Airport, the Algarve’s regional airport. Skyscanner.net is a very useful website for finding cheap flights. Accommodation: Whether it’s an apartment or villa, hotel or hostel, there are plenty of accommodation options to choose from in Albufeira. Booking.com is typically the best website for finding accommodation deals in Albufeira. Transportation: Are you planning to hire a car? If not, do you know how you’ll get from Faro Airport to Albufeira? The easiest way is to arrange an airport transfer using a service like Welcome Pickups, but you can also get to Albufeira by shuttle bus or public transport (bus and train). Travel Insurance: It’s always a good idea to organise travel insurance, just in case anything (from delayed flights to medical emergencies) goes wrong. When’s the best time to visit Albufeira? It depends what you’re looking for. July and August are the two most popular months on the Algarve, with August being the most popular, as this is when families usually travel. During these two months, prices will be higher and Albufeira will be a lot more crowded but, for some people, that buzzing atmosphere is exactly what they’re looking for. If that’s not what you’re looking for, consider June or September. Prices are lower than July and August, the weather is normally still fantastic, and the streets, restaurants, and beaches in Albufeira won’t be quite as crowded. If you’re looking to escape crowds, however, maybe it’s worth considering another seaside town like Carvoeiro or Alvor? The tourist season on the Algarve runs from around April until the end of October, with the busiest months being July and August. During the off-season months (November – March), Albufeira will be very quiet. Not as quiet as other towns on the Algarve, but still very quiet. Many of the bars and restaurants will close for the entire period, and you’ll only spot a few other tourists wandering around. A few places will still be open, however. You’ll find more than enough bars and restaurants to entertain you for a week’s holiday, and prices at this time of year will normally be a fraction of what they are in the summer. Although the weather is nowhere near as hot as it is in the summer (and sometimes it’s just a bit too warm), it’s still fairly warm and a great destination for some winter sun and attracts quite a few sunseekers around Christmas and New Year. Faro Airport, the Algarve’s regional airport, is roughly 45 km from Albufeira. There are several ways to get from Faro Airport to Albufeira, including airport transfer, public transport, and by taxi. Airport Transfer: The easiest way to get from Faro Airport to Albufeira is by airport transfer using a service like Welcome Pickups. Rental Car: If you’re planning on exploring the Algarve, including its many beautiful beaches, you may want to consider renting a car through a site like rentalcars.com (see: renting a car at Faro Airport). Public Transport: To take the train or bus to Albufeira, you’ll normally need to go to the train or bus station in Faro City Centre first (take the airport bus #16) or a taxi. During the summer months, however, Eva-Bus does operate a bus from Faro Airport to Albufeira. Train: Albufeira’s train station, Albufeira-Ferreiras, is roughly 5.5 km from the town centre. There’s a taxi rank outside the train station, as well as a bus station, that’ll take you into Albufeira. Bus: If the Eva Bus service isn’t running from the airport to Albufeira, you’ll need to take the bus from Faro to Albufeira. This is actually easier than the train as it takes you directly to the town centre. Taxi (or Uber): Taxis are available from outside of Faro Airport. These are normally slightly more expensive than an airport transfer, but perfect for those that haven’t booked anything in advance. Shuttle bus: Shuttle bus transfers can be booked through websites like hoppa.com.